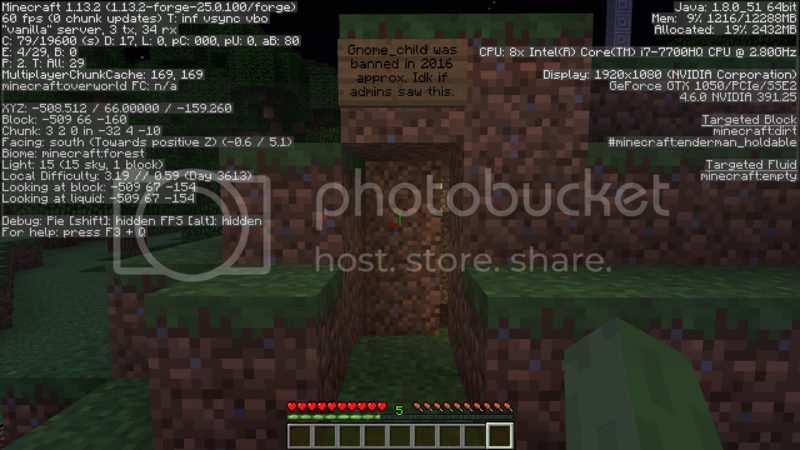 hypehuman started the conversation Ban appeal for _Gnome_Child_. hypehuman posted in Can't log in. I'm back in! Last failed attempt was 14:51:12 UTC. So sometime between now and then, the issue was resolved. Gets stuck on "Loading terrain...". After about 10-20 seconds, it says "Connection Lost" "Disconnected". I couldn't find anything useful in the log. hypehuman started the conversation Can't log in. A few minutes ago, the game got really laggy and then I was disconnected. Now I can't log in at all; it gets stuck on "Loading Terrain". it seems that other players are still logged in, and I am able to log into another server. hypehuman posted in When will it rain??? . @deyahruhd What you need to do is set up a contraption where you have minecart tracks aimed directly into a cactus. Then, insert a beacon into a chest minecart placed on a powered rail. You want to go far enough way until the cactus unloads but the minecart doesn't, then activate the powered rail. If there are any chunks loaded beyond 10 chunks of that cactus, the minecart will break and drop its beacon, otherwise you will find it sitting right next to the cactus unharmed. The chances of the exploit working is increased significantly if it's raining, by the way. Wow, that's really specific. I can't imagine how it works, but I'm curious to understand more. Do you have any details? I couldn't find anything about this on google. hypehuman posted in Word Association. hypehuman posted in Control Panel and Private Teleport Requests. @Cileklim This. The new system that we use is sadly a huge downgrade from the book system. I'm aware of the fact that its not possible to use the old system in 1.13 but having to open a browser just to not spam the chat with commands is simply unpractical. I agree; having to tab away from the game leaves your character vulnerable to unexpected situations. However, it looks like I can access the control panel on my phone, so that should be a good solution for a lot of people. Unfortunately it's a solution that might not be possible for some.